For other uses, see Three Amigos (disambiguation). Three Amigos is a 1986 American western comedy film directed by John Landis and written by Lorne Michaels, Steve Martin, and Randy Newman. Martin, Chevy Chase, and Martin Short star as the title characters, three silent film stars who are mistaken for real heroes by the suffering people of a small Mexican village. They must find a way to live up to their reputation and stop a marauding bandit. In 1916, the bandit El Guapo and his gang are collecting protection money from the Mexican village of Santo Poco. Carmen, daughter of the village leader, searches for someone who can come to the rescue of her townspeople. While visiting a village church, she sees a silent film featuring "The Three Amigos" and, believing them to be real heroes, sends a telegram asking them to come and stop El Guapo. Meanwhile, Lucky Day, Dusty Bottoms, and Ned Nederlander are silent film actors from Los Angeles, California, who portray the Amigos on screen. When they demand a salary increase, studio executive Harry Flugleman is forced to dismiss them. Shortly afterward, they receive Carmen's telegram but misinterpret it as an invitation to make a show appearance with El Guapo. After breaking into the studio to retrieve their costumes, the Amigos head for Mexico. Stopping at a cantina near Santo Poco, they are mistaken for associates of a fast-shooting German pilot, who is also looking for El Guapo and who arrived just before they did. The Amigos perform a show at the Cantina, singing "My Little Buttercup", and leave the locals bemused. The German's real associates then arrive at the cantina, proving themselves adept with their pistols. A relieved Carmen picks up the Amigos and takes them to the village, where they are put up in the best house in town and treated very well. The next morning, when three of El Guapo's men come to raid the village, the Amigos do a Hollywood-style stunt show that leaves the men very confused. The bandits ride off, making everyone think that the Amigos have defeated the enemy. In reality, the men inform El Guapo of what has happened, and he decides to return the next day and kill the Amigos. The village throws a boisterous celebration for the Amigos and their victory. The next morning, El Guapo and his gang come to Santo Poco and call out the Amigos, who confess they are too scared to confront him after Lucky gets shot in the arm. El Guapo allows his men to loot the village and kidnap Carmen, and the Amigos leave Santo Poco in disgrace. Ned persuades Lucky and Dusty to go after El Guapo. They spot a cargo plane and follow it; the plane is flown by the German, who has brought a shipment of rifles for the gang. Preparations are underway for El Guapo's 40th birthday party, and he plans to make Carmen his bride. The Amigos try to sneak into the hideout, with mixed results: Lucky is captured and chained up in a dungeon, Dusty crashes through a window into Carmen's room, and Ned ends up stuck in the piñata. Lucky frees himself, but Dusty and Ned are caught. The German, having idolized Ned's quick-draw and gun spinning pistol skills since childhood, challenges him to a shootout. Ned kills the German, and Lucky holds El Guapo at gunpoint long enough for Carmen and the Amigos to escape in the German's plane. Returning to Santo Poco with El Guapo's army in pursuit, the Amigos rally the villagers to stand up for themselves, and drawing inspiration from one of their old films, they have the villagers create improvised Amigos costumes. The bandits arrive, only to find themselves suddenly being shot at by Amigos from all sides and falling into hidden trenches dug by the villagers. El Guapo's men either ride off or are shot, and he takes a fatal wound as well. As he lies dying, the villagers, all dressed as Amigos, step out to confront him. El Guapo congratulates them, then shoots Lucky in the foot and dies. The villagers offer to give the Amigos all the money they have, but the Amigos refuse it, saying (as in their movies) that seeing justice done is enough of a reward for them. They then ride off into the sunset. The film was written by Martin, Michaels, and Randy Newman. According to Michaels, Martin approached him with the idea of the film and asked him to co-write it with him. Newman contributed three original songs: "The Ballad of the Three Amigos", "My Little Buttercup", and "Blue Shadows", while the musical score was composed by Elmer Bernstein. It was shot in Simi Valley, California, Coronado National Forest, Old Tucson Studios, and Hollywood. John Landis was on trial over the Twilight Zone tragedy during the editing of Three Amigos, and the studio heavily edited the film down after he submitted his final cut. Since he is a co-screenwriter, Martin had been attached to the project since 1980 and he, Dan Aykroyd, and John Belushi were originally going to play the Three Amigos. At one point, Steven Spielberg was slated to direct; he wanted Martin, Bill Murray, and Robin Williams to portray Lucky, Dusty and Ned, respectively. Landis has said that Rick Moranis would have been cast as Ned, had Short been unavailable. Martin developed tinnitus after filming a pistol-shooting scene for the film. Several deleted scenes were included in the Blu-ray release. An alternate opening featured the peaceful village of Santo Poco being rampaged upon by El Guapo and his men, prompting Carmen's search for help. Extended sequences of the Three Amigos at the studio mansion and backlot lead into another deleted subplot involving an up-and-coming rival actress at the studio, Miss Rene (Fran Drescher). A deleted scene featuring Sam Kinison as a mountain man was lost, as were most of Drescher's other scenes. Elmer Bernstein wrote the score for Three Amigos and Randy Newman wrote the songs. "Ballad of the Three Amigos"
Three Amigos had a US gross of $39.2 million. Review aggregator Rotten Tomatoes reports that 47% of 38 film critics gave the film a positive review; the average rating is 5.1 out of 10. The site's critical consensus reads, "Three Amigos! stars a trio of gifted comedians and has an agreeably silly sense of humor, but they're often adrift in a dawdling story with too few laugh-out-loud moments." Film critic Roger Ebert awarded the film one out of four stars and said, "The ideas to make Three Amigos into a good comedy are here, but the madness is missing." Janet Maslin of The New York Times wrote that it was "likable" but lacked a "distinctive style", though certain jokes are crafted with "enjoyable sophistication". Caroline Wetsbrook of Empire awarded the film three out of five stars and wrote that it was "good-natured enough to sustain its ultimately thin premise". Despite this, the film has since been reviewed more favorably and has become a cult classic. Neil McNally of the website Den of Geek noted that the film was "unfairly overlooked" when first released, and praised the performances of Martin, Chase, and Short; the comedic scriptwriting of Landis; and the "sweeping, majestic" score by Bernstein. The film was ranked #79 on Bravo's list of the "100 Funniest Movies". ^ "THREE AMIGOS (PG)". British Board of Film Classification. December 19, 1986. Retrieved March 24, 2016. 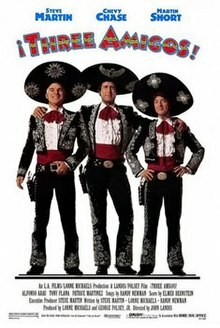 ^ a b "Three Amigos (1986) - Box Office Mojo". Retrieved May 18, 2015. ^ "Norm Macdonald Has a Show: Season 1, Episode 10: Lorne Michaels". www.netflix.com. Retrieved September 19, 2018. ^ Michael Reuben. "Three Amigos! Blu-ray". Blu-ray.com. Retrieved May 18, 2015. ^ a b c Evans, Bradford (December 15, 2011). "The Lost Roles of Three Amigos". Split Insider. Retrieved July 8, 2013. ^ "Tinnitus Sufferers and You: Do you hear that?!". Dallas Ear Institute. Retrieved September 3, 2015. ^ a b Three Amigos 25th Anniversary Edition (Blu-ray). 2011. ^ "Three Amigos!". Rotten Tomatoes. Retrieved December 20, 2012. ^ Maslin, Janet (December 12, 1986). "Movie Review - - FILM: 'THREE AMIGOS'". The New York Times. Retrieved June 23, 2016. ^ "Three Amigos! Review". Empire Online. March 3, 2006. Retrieved April 23, 2016. ^ McNally, Neil (November 20, 2012). "Looking Back at Three Amigos". Den of Geek. Retrieved June 23, 2016. ^ Fraley, Jason. "BRAVO 100 Funniest Movies". Bravo. The Film Spectrum. Retrieved December 20, 2012.